I’ve noticed that when the Japanese Beetle traps are full, the lure is still working and drawing beetles in. Having no place to go they turn to our plants, which then become covered with even more tiny crawling, shiny, black bug bodies than usual. 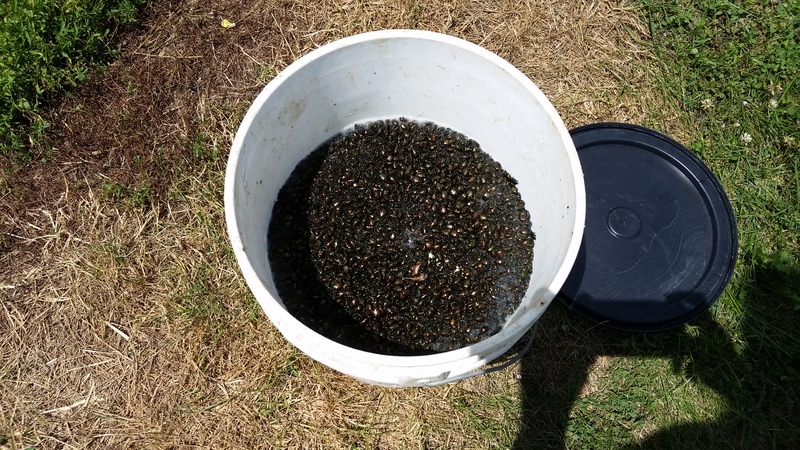 When we empty them, there are fewer beetles on our plants and more in the traps. So when we are gone all day and don’t empty the traps until evening, the damage done to our trees and vines is much worse. 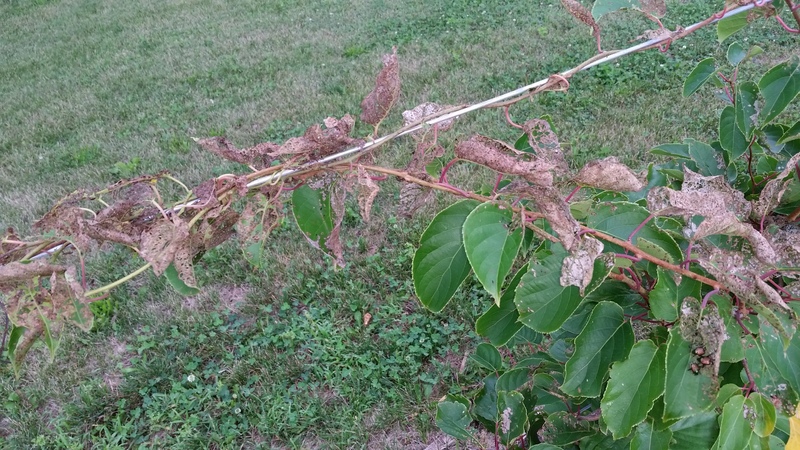 Leaves are laced and fruit is chomped. I empty the traps at least twice a day, filling two 5 gallon buckets and each time the creepers are crawling at the top and out of them, flying off to find other tasty food. What if the traps draw in more beetles than are already present on our land? What if the placement of each trap draws from outside our property? What if, in trying to rid them from our homestead, we’re drawing in more from neighbors or the corn fields around us? This weekend, we are experimenting to test our hypothesis. 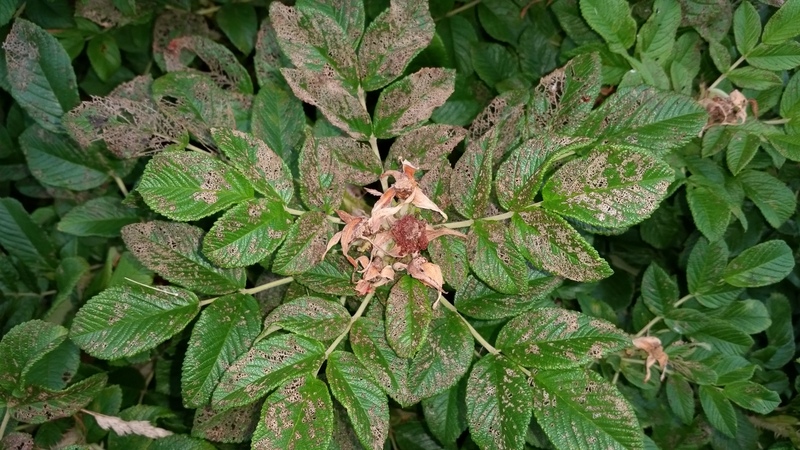 I’ve taken pictures of some of the plants the beetles attack the most. 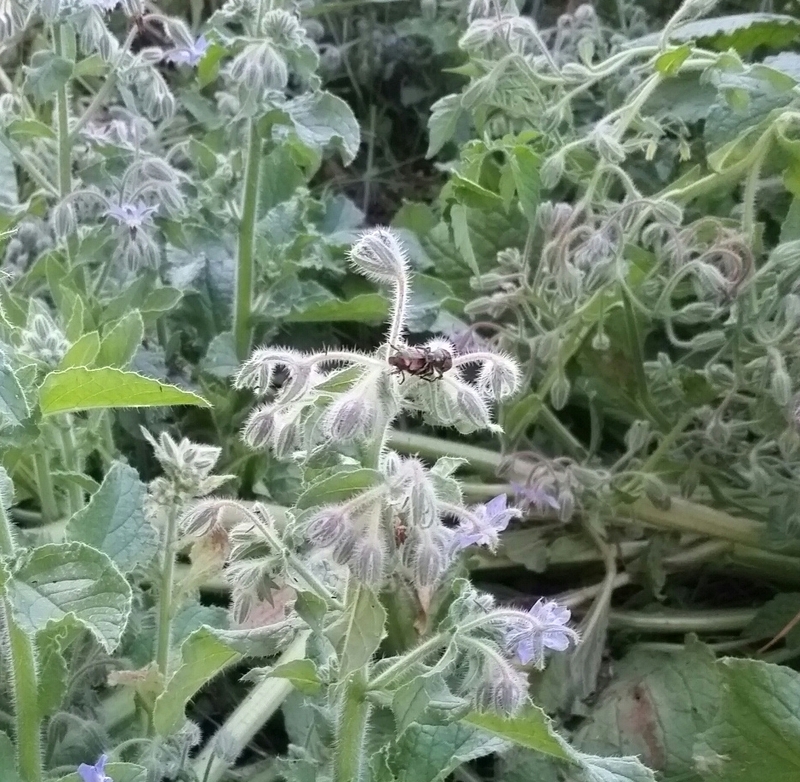 The borage, which peppers the kitchen garden, is one of their favorites. Since they start at the top and work their way down, the vineyard is especially vulnerable…they particularly enjoy the kiwi leaves. Yet the leafy mint they leave alone. The rose bushes, which have a similar scent to the lure, are one of their favorites. They munch on leaf and flower and bud. So…we are conducting an experiment. 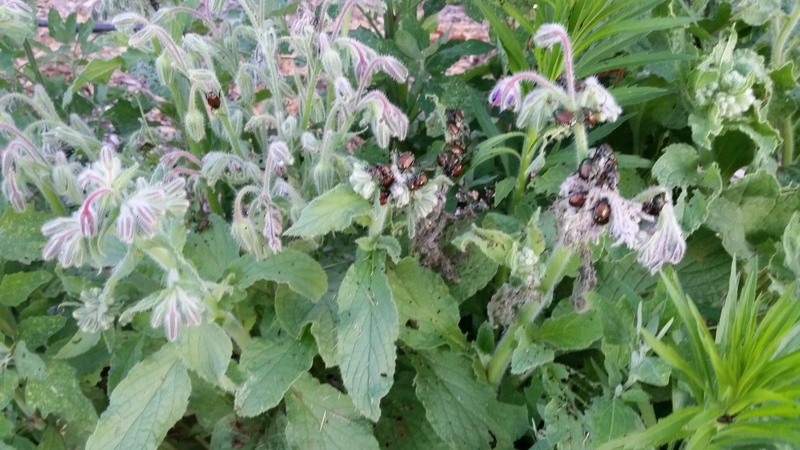 I’ve already removed the traps and lures and when I went out this morning…there weren’t as many beetles on the plants. True, it is overcast and rainy which seems to deter them a bit, but I’m hopeful that there will be fewer even on sunny, hot days once I remove the traps. In researching and in asking Bill Wilson of Midwest Permaculture, I’ve read that super healthy plants create a natural insect repellant because they have all of their nutritional needs met…and that starts with soil. So…the beetles prey on the weak just like any other predator. Nutrient rich soil=rockstar plants and trees that fight off pests. It’s survival of the fittest…may the strongest plants win. We already have healthier soil since we’ve moved in and started planting and fertilizing. We are now going step up our efforts to ensure that we have good, healthy soil so we can have good, healthy plants. Maybe, we’ll be able to manage them and at least keep them from eating all of the leaves on the trees, vines, shrubs and grapes. Maybe, it won’t be as bad next year if we bump up the effort to make our soil even healthier than we’ve already made it. This entry was posted in Garden Stories, Haiku, Permaculture, Poetry. Bookmark the permalink. 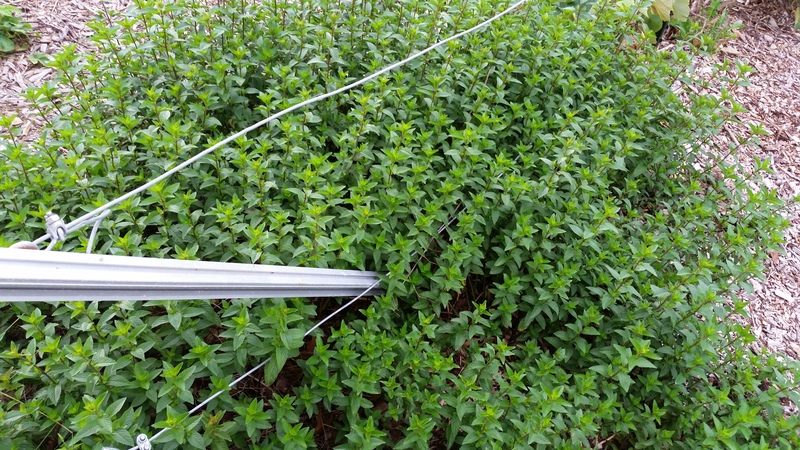 If that doesn’t work you could try keeping the traps at the edge of your property instead of near the plants? We keep them away from the plants to try and draw them off. We try to keep them downwind too.